We roared up on our ATV's trailing dirt clouds behind us and stopped at a Mayan ruin. We dismounted our iron horses and commenced to climb to the top of the ruin. There, our guide explained that this was the tomb for two people upon which we were standing. I have photographs of the ruins I ruined. I have photographs of the "rain forest" I ruined to reach the ruins. We reached it via a long trail chopped through the trees and foliage. It was a beautiful view. The panoramic vista revealed land everywhere, just waiting to be developed. It was here that we first began to notice the insects. Yellow flies and mosquitos that had not been able to keep up with our ATVs were now attacking us. We applied insecticide. The hiking group arrived late, with the eco-freaks huffing and puffing. The yellow flies and mosquitos had been feasting upon them if they did not use insecticide (or the kinder, gentler "repellents") to fight off mother nature. The guide explained that these Mayans had a god named "Ixchel" and they believed that good things came from the east and southeast because the sun rose in the east; and bad things came from the west and north (where the sun set and where cold winds blow). That is a good philosophy for Florida and the Southeast U.S.
Later, some Indians demonstrated ancient dances using incense. The original dance probably involved peyote and the incense was probably another intoxicant, all of which is illegal now, in favor of the alcohol (firewater) that the tourists imbibed to excess during the dance. These had been the Mayans of course, practicing the ultimate form of socialism / altruism / sacrifice -human sacrifice for the "good of the community." 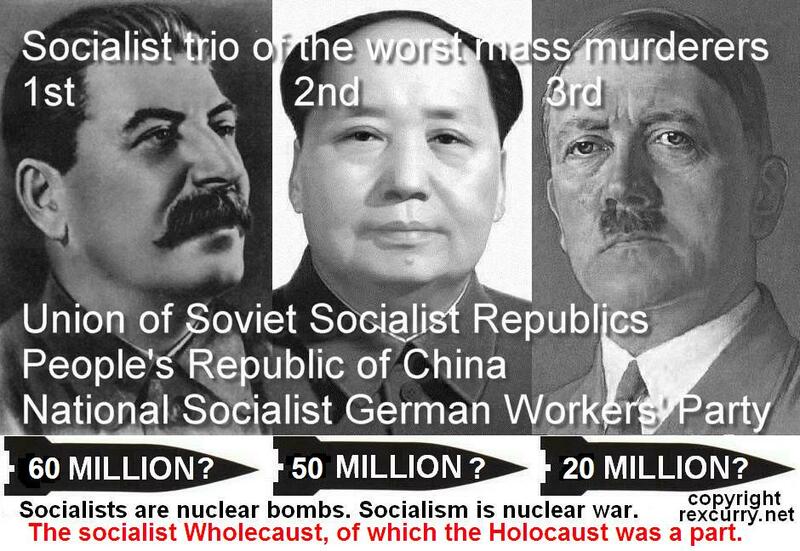 The world still has not rejected their philosophy, and even exceeded their death toll in the socialist trio of atrocities (see http://rexcurry.net/socialists.jpg): The socialist Wholecaust occurred under the industrial armies the Union of Soviet Socialist Republics (62 million deaths); the People's Republic of China (35 million); and the National Socialist German Workers’ Party (21 million) (numbers from Professor R. J. Rummel's article in the Encyclopedia of Genocide (1999)). The hikers were standing in a group and watching us as we roared off on our four-wheeled ATVs, coating them in a cloud of our dirt dust. On another tour we enjoyed real horses, not the mechanical ATV variety. Real horses are much slower and less comfortable. The insects can keep up and they bother you and the horse (and the horse can put you in a wheelchair paralyzed for the rest of your life even if you never ask it to do more than walk). I had a choice between a horse named "Widowmaker" and "Gringo killer." I begged the guide for a gun. Instead, I had to make do with a baseball bat. It is fortunate that I never had to use it.